Almo Professional A/V wrapped its 2016 E4 AV Tour in Dallas on Tuesday Oct. 18th. The final E4 event of the year, featuring an exhibit floor and InfoComm CTS-accredited courses and workshops, saw good attendance from across Texas and from some folks coming in from other states. The event also gave a good look at Almo’s new service offerings for AV integrators. Is Almo one of the most important AV gear distributors in this industry? Yes, and the E4 event in Dallas bore that out. But equally interesting for the AV industry is Almo’s broadening of their service offerings, that go beyond providing gear to help integrators increase profitability and recurring revenue. Speaking of gear– there was plenty of AV gear on hand at the E4 Dallas event. Companies that had booths and showed there latest included: Samsung, LG, Planar, Leyard, Toshiba, Epson, Canon, ATEN, Viewsonic, Peerless-AV, Sharp, tvONE, Panasonic, DA-LITE, JBL, Premier Mounts, AMX, NEC, Chief, Optoma, Barco, Atlona, ZeeVee, BrightSign, Kramer, InFocus, ClearOne, and more. 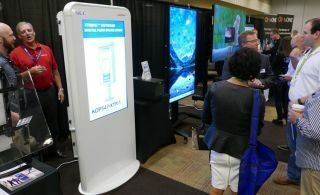 There were too many interesting products to mention them all here, but highlights include: OLED screens from LG; Samsung had its own room showcasing 1.9mm pixel pitch direct view LED, and “mirror” flat panels; Leyard fine pixel pitch direct view LED; the ATEN 12 output video wall media player, both landscape and portrait with mosaic look, done with a single player; a new laser projector from Optoma that will debut officially in November; a new Canon 4K laser projector (that was also shown at Infocomm in June); IADEA’s Excite-65 digital signage offering that triggers content in a retail store when a customer picks up a product from a rack or display. As the event was wrapping in Dallas, Melody Craigmyle, vice president of marketing for Almo Professional A/V, and Almo EVP/COO Sam Taylor, sat down with me and explained that Almo has a new service offering to help integrators increase their profitability and recurring revenue. And they put the new offering in perspective, as Almo has offered in recent years a variety of new services. Almo CONNECT, that allows integrators to offer their customers reliable, scalable and robust business solutions including Internet, Live TV and Advanced Voice, was announced in late 2015. Also last year, Almo Professional A/V expanded its Content Creation Services to include options aimed at deepening the range of revenue-generating content creation choices for integrators looking to add this service into their digital signage mix, according to a company announcement. Fast forward to this fall, and Almo has now added Control Systems Services as another managed service offering, designed to provide Almo partners support with control system and DSP programming for AMX, ClearOne, and Crestron. According to Sam Taylor, “with this new service that we can provide integrators, they don’t have to add full time employees to do so many of those resource-draining AV control tasks”. Taylor was referring to control tasks such as setting up AMX Rapid Project Manager (RPM), AMX’s configurable system for expedited project turnaround, as well as custom AMX projects; tuning and configuring of ClearOne DSPs to ensure the best sound quality; and programming of Crestron automation and control systems. Jay Saret, business development manager at Almo, added, “we can provide the integrator a single point of contact, to make that whole control system process go more smoothly. And remember, this program is not tied to only one brand of control system. We are platform agnostic. And, it is available for use with both new and previously purchased or spec’ed control system gear”.